The first ever Pirelli Shootout for the 2017 Liqui-Moly Bathurst 12 Hour had delivered in spades with lap after lap of edge-of-your-seat action by the top ten contenders. 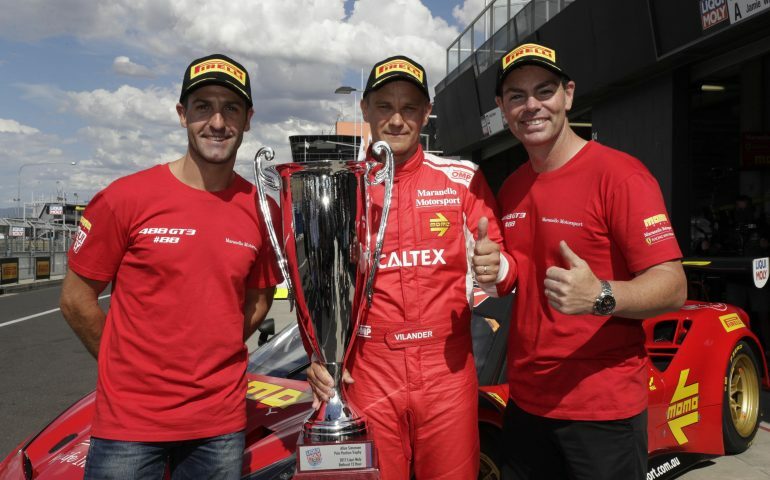 In an emotional result, the #88 Maranello Motorsport Ferrari 488 GT3 took out pole position for the fight for the Allan Simonsen trophy – named after the late driver whose story is intertwined with the Ferrari outfit. The #88 entry will lead the field in greeting the starter at 5.45am AEDT tomorrow (Sunday 5 February) after Tony Vilander set the fastest lap of the Shootout with the first and only ‘two’ of the outing – a 2m 02.861s. Joining him on the front row will be the #90 Castrol MARC Cars Australia BMW M6 after Chaz Mostert set the second-quickest time of the session immediately prior to Vilander’s lap with a 2m 03.055s effort. The first cab off the rank was the 10th fastest from Q2, the #1 Tekno Autosports McLaren. Alvaro Parente punched out a 2m 03.978s lap including a dropped wheel off the outside of the final corner. Next it was the #5 GT Motorsport Audi R8 LMS’ turn, with Nathan Antunes at the wheel. A hard lap delivered a 2m 04.473s time stamp. Ashley Walsh aboard the #35 Infants Friend Team Lubrimaxx MSM Aston Martin V12 Vantage was up next, and after three green sectors took himself to the top of the times at that point with a 2m 03.823s lap. “That was a neat little lap wasn’t it! He is really good at pushing it across the top and he used every single inch,” Walsh’s team mate George Miedecke said as the #35 undertook its cool-down circulation. Earl Bamber and the #911 Walkinshaw GT3 Prosche 911 followed, setting a 2m 04.067s lap to be third fastest at the time. Next in line was the #8 Bentley Team M-Sport Bentley Continental GT3. Maxime Soulet set a 2m 03.968s lap to go to second on the sheets, pushing Parente and Bamber down the order despite dropping a wheel on the run to Meguiar’s Corner. With Timo Glock at the wheel, the #7 Team Castrol Vodafone Team SRM BMW M6 GT3 then laid down a surprising 2m 04.288s lap to slot into fifth behind Bamber, with co-driver Mark Skaife telling commentators that Glock reported making a mistake at Virgin Australia Corner (turn one) which adversely affected their result from the get-go. The #12 Competition Motorsports powered by Ice Break Porsche 911 was then fielded by Matt Campbell, who set a 2m 04.366s lap to be sixth on the sheets ahead of Antunes. Then, things started to get very intersting as the clouds came over and the track temperature cooled slightly. The #60 Laser Plumbing and Electrical BMW M6 had Marco Wittmann at the wheel for its flying lap around the Mountain. Wittmann took the #60 to the top of the sheets with a very smooth 2m 023.249s lap which included a middle sector that took half a second off the previous top time of Walsh. “That was really good. The clouds have just covered the sun a little bit so I think these last couple of runs from the guys are going to be a bit tight. He was commtited and had a big crack there, and had a big second sector,” team mate Mark Winterbottom said after Wittmann’s performance. As ‘Frosty’ eluded to, the fight was far from over, with it then being time for Chaz Mostert to take to the Mountain for his shootout lap in the #90 Castrol MARC Cars Australia BMW M6. Two green sectors saw Mostert heading to the final corners looking likely to take his green machine to the top, and that is exactly what he did – setting a 2m 03.055 second lap to bump his fellow BMW driver from the provisional pole. “He has been hot all weekend mate. Everyone in this team is motivated and Chaz just pulled it all together there, I have a great feeling about tomorrow,” Mostert’s team mate Max Twigg said after the lap. Then, there was only one left – the #88 Maranello Motorsport Ferrari 488 GT3 was the last of the ten after setting the fastest time in Q2. Toni Vilander went green for the first sector, but wasn’t able to better Moster’s middle sector time. After everyone held their breath, he crossed the line with a 2m 02.861s effort – the first and only ‘two’ for the Pirelli Shootout. Vilander’s co-driver Craig Lowndes was obviously happy with the result when interviewed immediately following the conclusion of the lap. “That was prety intense, it’s a hot day and looking at the times we thought the track might have gone off but Toni did a great job. He knows the car so well and Jamie and I are trying to support him as well as we can,” Lowndes said.